INDEPENDENCE, Kan. – The No. 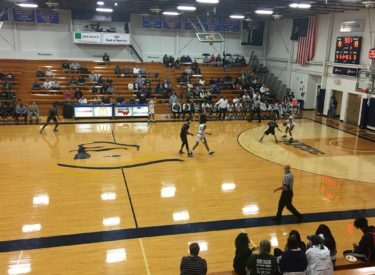 19 Seward County men’s basketball team continues to separate themselves from the pack in the Jayhawk Conference, defeating the Independence Pirates 77-64 to stay in first place. The win pushes the Saints to 12-3 overall and 5-1 in Jayhawk play. It was a slow start to the game for the Saints, hitting just one field goal in the first six minutes of play. Seward used an 11-4 run over the next two minutes to take a 14-12 lead with a Marco Morency three. Seward kept the two-point lead at the media break, leading the Pirates 19-17 with under ten minutes in the half. After the Pirates tied the game at 19, the teams went over three minutes without making a field goal until Independence broke the drought with a three. The Pirates took a 26-19 lead before the Saints broke their scoreless streak with back-to-back dunks from Isiah Small and Devin Bethely to make it 26-23. Those dunks sparked an 11-0 run by the Saints as they took a 30-26 lead. Seward took a 41-35 lead into halftime. Seward quickly pushed their lead to double-digits, starting the second half on an 8-2 run to take a 49-37 lead after Montrevion Flowers drilled a corner three. Seward’s nationally ranked defense began to flex its muscle as the Pirates found it hard to score to start the second half, allowing just eight points through the first ten minutes of play as the Saints increased their lead to 15 points before the media timeout. After Seward went up by 17 points, the Pirates came storming, trimming the lead eight points using a 9-0 run. A timeout helped refocus the Saints as they grew their lead back to 14 points with under five minutes to play. The offense moved through Flowers in the second half as he scored 15 points of the Saints 36 second half points. The Saints held onto their lead down the stretch, defeating the Pirates 77-64. Seward shot 50.9 percent (27-for-53) from the floor and 38.5 percent (10-for-26) from deep. The Pirates shot 46 percent (23-for-50) from the field but just 22.2 percent (2-for-9) from behind the arc. The Saints had four players reach double-figures, led by Montrevion Flower’s career-high 20 points. Marco Morency (14 pts), Reggie Miller (11 pts) and Devin Bethely (10 pts) each joined Flowers in double-figures. Seward will return home on Saturday (Jan. 12) when they host the Neosho County Panthers at 8:00 p.m. inside the Greenhouse. Free tickets are available at Conestoga and both Liberal Hutch’s locations thanks to our sponsor, Conestoga.